This article submitted by Linda Stelling on 07/29/97. State commander Dan Ludwig, back left, with the charter members of the Lake Henry Legion: Urban Spanier, Peter Ludwig, Ralph Fischbach, Roman Wuertz, and Clarence Lieser. 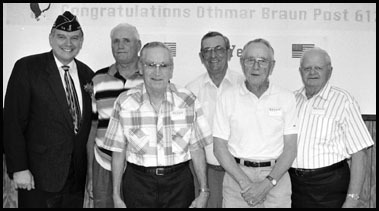 Members and friends of the Othmar Braun American Legion Post 612, Lake Henry, gathered Saturday evening to celebrate the post‘s 50th anniversary. Five of the 17 charter members who helped form the new post in 1947 were present for the festivities. Present were Clarence Lieser, Peter Ludwig, Ralph Fischbach, Roman Wuertz, and Urban Spanier. Master of ceremonies for the evening was Sixth District Legion Commander Richard Philabaum. Guest speaker was Dan Ludwig, past national legion commander. The post was named after Othmar Braun, Lake Henry, a young navy man killed in action during the battle of the Marshal Islands. The newly formed organization elected Peter Ludwig, Sr., a former member of the Paynesville American Legion Post and a World War I Veteran as commander. Records indicate they participated in American Legion programs, funerals, school programs and Memorial Day activities. The largest fund raiser at the time was an annual fall turkey raffle. In the beginning, meetings were held alternating between the downstairs at the Hess Bar and the hall at Otto’s Place. During the 1950s, a drill team was formed, and became very active and popular, participating in many area parades and the firing squad participated in military funerals. This group consisted of about 20 men who would take time off from work to participate in all kinds of weather. In the early years, a Legion baseball team was sponsored, later to be broken into teams where more youngsters could participate. At the present, there are 11 PeeWee teams and 10 American Legion high school age teams competing in area communities, for a total of about 250 youngsters. During the late 60s, the post received a boost with the formation of an auxiliary. One of the living auxiliary organizers was present for the celebration, Irene Wuertz. With the women actively helping the Legion, it became necessary to go house hunting. In 1970, the Legion made its big move by purchasing the former District 1966 schoolhouse. It was here they started to observe Memorial Day services with an outdoor mass. The first addition to the club was a pole shed. In the mid 1970s, a Bowery Dance was held as a fund raiser to pay for remodeling and miscellaneous bills. In 1985, another addition was built to the east. The current phase of improvements began in 1996, making the facility handicap accessible. Charter members of the post were Aloys, Henry, and Leander Braun, Clarence Lieser, Lothar and Edmund Hess, Peter Ludwig, Ralph Fischbach, James Mueller, Donald Lenz, Andrew Gottwald, Roman Wuertz, Marvin Beier, Elmer Zirbes, Edward Horn, Wilfred Mueller and Urban Spanier. Post commanders serving since 1947 are: Pete Ludwig, Norbert Hess, James Mueller, Werner Kraemer, Lother Hess, Urban Spanier, Leander Braun, Celestine Uphoff, Ralph Brick, Virgil Silbernick, Joe Hemmesch, Norbert Wuertz, Adelbert Lodermeier, Gerald Braun, Cyril Winters, John Heinen, Donald Lenz, Lee Schulzetenberg, Floribert Jaeger, Rueben Athmann, Floyd Hess, Hubert Lieser, Marvin Kunstleben, Gerald Kyersath, Richard Philabaum, Jerome Lieser, Frank Soenneker, Paul Orbeck, and Jack Holthaus.